Nload is a console application which monitors network traffic and bandwidth usage in real time. The gathered statistics are displayed in two separate graphs (one for uplink and one for downlink). Nload also provides detailed information about the total amount of transferred data and average, minimum and maximum transfer rate. We used this application in its simplest mode – Nload interface. There are, however, many different display options and additional configuration options you can read about in the application’s man page – $ man nload. DOS attacks – Analysis of connections suspected of originating DOS attacks. Geolocation – Identification of connection’s country of origin. Port connection usage – amount of connections on a particular port. URL connection usage – amount of connections tied to a particular URL by requests. As an example, we’ll show the use of Moloch for analysis of the CICIDS 2017 dataset, where we analyze a DDoS Hulk attack. First, we filter the traffic. Using the command tags == CICIDS2017_WEDNESDAY && ip.dst == 192.168.10.50 we extract the traffic from the day of the attack with the webserver’s IP as the destination address. 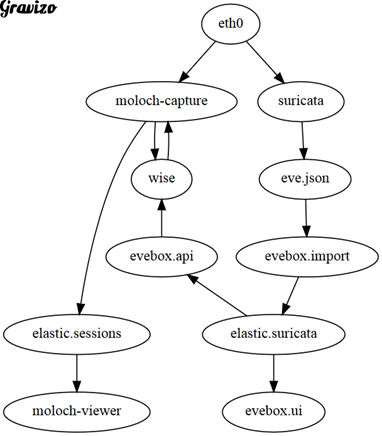 Elasticsearch – search engine powering the Moloch system. It is distributed under the terms of Apache license. Requests are handled using HTTP and results are returned in JSON file format. Elasticsearch supports database sharding, making it fast and scalable. Capture – C language based application for real-time network traffic monitoring. Captured data is written to disk in PCAP format. Alternatively, it can be used to import PCAP files for analysis and archiving manually through command line. The application analyzes protocols of OSI layers three through seven and creates SPI data which it sends to the Elasticsearch cluster for indexing. Viewer – The viewer uses a number of node.js tools. Node.js is an event-based, server-side Javascrip platform with its own HTTP and JSON communication. Viewer runs on each device with running Capture module and it provides a web UI for searching, displaying and exporting of PCAP files. GUI/API calls are carried out using URIs, enabling integration with security information and event management (SIEM) systems, consoles or command line for PCAP file obtaining. All the components can be located and run on a single node, however this is not recommended for processing of larger data flows. Whether the data flow is too large can be determined by requests taking too long to respond, in that case, transition to multi-node architecture is advised. The individual components have distinct requirements, Capture requires large amounts of disk space to store received PCAP files, by contrast, Elasticsearch requires large amount of RAM for idexing and searching. The viewer has the smallest requirements of the three, allowing it to be located anywhere. You can find out the maximum buffer size using the ethool -g command, to check NIC’s services use the ethtool -k command. Disable most of NIC’s services, since you want to capture network traffic instead of what the OS can see they are not going to be used anyway. In our topology, the server running Moloch was connected to a 100Mbps switch, therefore, even though the generated network traffic reached 140Mbps, the flow was subsequently limited on switch. At first, while generating packets with a generated IP address from cloud to a lab PC, we’ve had a problem with cloud’s security policies. These policies prevented sending of packets with source IP address different from the one assigned to the hosting cloud instance, therefore we have only generated traffic from a single source IP address to a single destination IP address. Installation of Moloch is no trivial matter, that is why we have prepared this guide on how to set up the system in cloud environment. The server obtains an IP address dynamically through DHCP, therefore no editing of the interface configuration file is required.